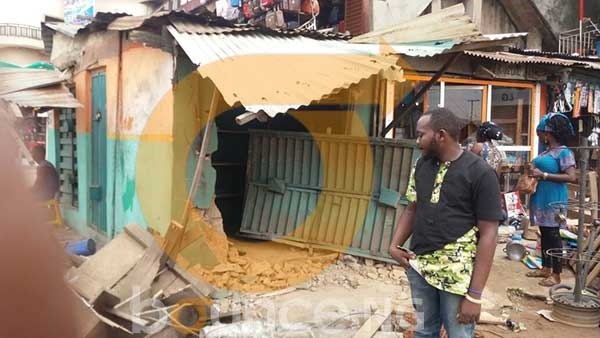 Several people were left injured after a commercial bus hit by a truck veered off the road and ran into a shop in Lagos. The accident happened around 10PM on Tuesday at the Egbeda market. The bus was said to be picking passengers along the road when the speeding truck hit it and few other private cars. 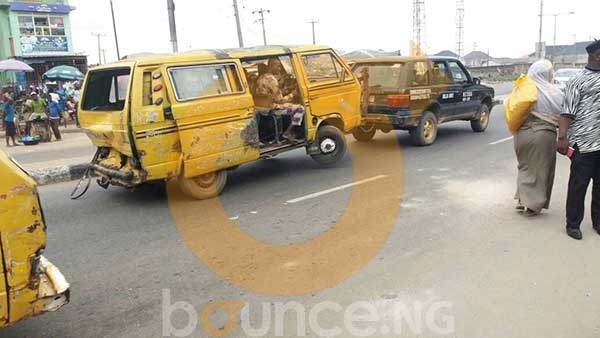 The commercial bus was the most badly hit as it rammed into a shop destroying goods worth thousands of naira. Passengers on board sustained various degrees of injuries but no one died as at this time of filing this report. Eye witness said the truck driver sped off after the incident leaving the victims to writhe in pain. Fortunately, passers-by ran to the rescue of the victims. They were quickly attended to and taken to a nearby hospital. An eyewitness told Bounce News this was the second time in the space of one week that this will be happening. She said a similar accident happened a week earlier, also involving a truck and a commercial bus.